The Marvel Universe keeps on expanding with upcoming movies introducing audiences to a host of new mutants, including #4 on ComicsAlliance’s list of 50 Sexiest Male Characters in Comics, Gambit. The former thief is a certainly one of the most charismatic X-Men, and fans are thrilled he’s finally getting his moment to shine on the big screen (yes, Gambit was already on screen once already, and no, we don’t talk about it). 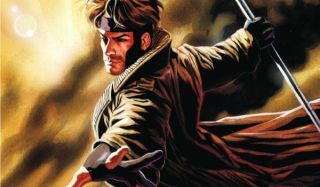 Gambit was originally supposed to debut in the fall of this year, but production delays have pushed back the timeline. We don’t know a heck of a lot about what to expect from the charming Cajun’s solo outing, but we do have a few key facts about how the movie will shake out. Read on for the all the intel, chere. The Gambit movie cast stars Channing Tatum, but with who? In case you’re not overly familiar with the Louisiana mutant known as Gambit, he first appeared in Uncanny X-Men way back in 1990. Raised from early childhood to be a master thief, Gambit can create and manipulate kinetic energy, typically to make things go boom. His weapons of choice are ordinary playing cards, which he charges and hurls at his enemies, but when a more up close and personal approach is called for, he wields his bo staff with ruthless efficiency. His past is full of many, many shady deeds (hey, he’s a thief, after all), which makes it difficult for the X-Men, most notably Wolverine, to really trust him after they join forces. Charming though he may be, it’s tough to know just when Gambit is being totally honest - assuming he ever is. Channing Tatum will adopt the glowing (yet still dreamy) eyes of Remy LeBeau, aka Gambit, for the character’s second cinematic appearance. Interestingly, Tatum was one of the actors being considered to play Gambit when that character was still part of X-Men: The Last Stand. Even if that weren’t true, back in January of 2014, X-Men franchise producer Lauren Schuler Donner said, “I’m dying to do a Gambit movie with Channing Tatum.” Taylor Kitsch played LeBeau in X- Men Origins: Wolverine, but didn’t get much love for his efforts. In fairness, not much in the movie got love, but Kitsch neither looked nor, more importantly, sounded the part, which made swapping him out for Tatum an easy choice. Back in 2014, Tatum said he’d “do anything” to be in one of the upcoming Marvel movies. “I would be in anything they put up, especially Gambit,” he told ScreenRant. Rumored to be joining Tatum is Lea Seydoux as Bella Donna Boudreaux, Remy’s childhood friend and (if the film follows the comics) bride-to-be. Seydoux’s work in Mission Impossible: Ghost Protocol shows she’s capable of the kind of physicality her role as a member of the Assassins’ Guild will likely require. Her work persuading James Bond to quit the spy biz in Spectre displays the kind of physicality her role as Remy LeBeau’s love interest may require, too. Looks like we're going to have to wait even longer for Gambit to grace us with his cinematic presence. Originally set for an October 2016 release, the production has been pushed back yet again - don't expect to see it before 2018. Producer Simon Kinberg isn't overly concerned, though, telling /FILM, "I think the truth is when you have these movies that need a very special and unique tone, it takes a little while to find that tone." Kinberg compares the movie's journey to that of another charismatic superhero, Deadpool. "Deadpool feels like it exploded out of nowhere but it was a ten-year development process on that movie. I hope that Gambit doesn't take ten years but it takes a little honing to get that tone and that voice exactly right," he says. Not much is known about the plot of Gambit other than that it will be an origin story that fits into the enormous film universe that Marvel has been crafting, but given the inclusion of Bella Donna Boudreaux, it seems likely that her ill-fated nuptials to Remy will be involved. According to the comics, Gambit was part of the Thieves’ Guild in New Orleans and was supposed to marry the Assassins’ Guild’s Bella Donna in the hopes of uniting the rival factions and ending their ongoing conflicts. Bella Donna’s brother challenged Remy to a duel and lost, so Remy ends up exiled and on his own (do you have to return the wedding gifts in that case? What’s the etiquette on that?). Remy and Bella’s backstory provides ample opportunity for action, especially given that she is also a mutant. What remains to be seen is if the conflict between the two houses will be the sole source of the tension, or if Remy’s eventual ties to the geneticist Mr. Sinister will also come into play. Screenwriter Joshua Zetumer (most recently of the RoboCop reboot) has plenty of good material to draw from, including how Gambit first encountered the X-Men, though that would be likely be its own film. Well, this took a bit of doing. It took so long to nail down who’d be sitting in the big chair that production on Gambit actually had to be pushed back; the movie was originally supposed to debut in October this year, but won’t even begin shooting until this month. The delay could be well worth it, though, because it means the tale of the ragin’ Cajun will be handled by Doug Liman, who most recently directed the outstanding Tom Cruise/Emily Blunt vehicle Edge of Tomorrow (or Live, Die, Repeat if you prefer). Liman is clearly no stranger to fast-paced, frenetic action sequences, so he would certainly seem to be a great fit for a movie about a superhero who uses kinetic energy as a weapon. He’s also got a deft hand at striking a great balance in action movies with strong male and female leads, as shown not just with Edge of Tomorrow, but also Mr. and Mrs. Smith. Expect to see at least one grand fight scene between Remy and Bella.